Why Should I get a Master's Degree in Education (M.Ed)? A Master's Degree in Education (M.Ed) can be a second step for those already teaching, or a first step into education for those that have been in a related field. A Master's Degree can open up doors to new careers within the educational realm or simply create a higher pay scale for those wishing to continue teaching. A Master's in Education degree (M.Ed) is typically for those who wish to teach or in some cases wish to become a principal or specialized person within a school. Those who choose to get Master's Degree in Education are usually teachers who wish to further their career by increasing their level of education, gaining a new specialty, becoming an administrator, or simply gaining more knowledge for their current subject. A Master's Degree in Education can allow a person to teach in the subject area of their choice, become a principal or administrator, work as a school counselor, or even become a specialist in an area such as Reading or Special Education. A Master's Degree in a general subject area can create the title of highly certified teacher in some areas, which often leads to a higher pay scale overall. MEd Degrees can be in any of the fields that a Bachelor's Degree is available in as well as some extended certifications. This means a Master's Degree can be gained in Reading, Math, Science, Social Studies, Elementary Education, Secondary Education, or any variant in these fields. Those holding a Master's Degree in Education are often lead teachers, specialists, or in some cases principals or administrators. A lead teacher in an elementary program may help direct other teachers in how to properly handle curriculum or assessments. A specialist, such as a Reading Specialist, may work with small groups of children or individuals in a classroom to improve reading skills and abilities. A Master's in administration/education could lead to a position as a principal or school leader that handles administrative duties. Many positions, such as teacher or administrator will require a teaching or administrative credential. The biggest benefit to earning a Master's in Education is the opportunity for career advancements. Other than climbing the career ladder, the number of specializations a teacher is qualified to teach can increase. In addition, the likelihood of an advancement in pay scale is high. Specialists in many fields are hard to come by, so a Master's can offer a leg up in the job market. Master's degrees can come in many different subject areas. In addition to the expected core subjects, someone may also get a Master's Degree as a Reading Specialist, Biology (or other sciences) major, Leadership (administration), and other subject specific areas. A school counselor can also often be accredited at the Master's level in Education. Certain requirements for a Master's degree in education are fairly common. Some of the most common are: An education or related field Bachelor's degree; An acceptable GPA, typically 3.0 or higher; Letters of reference; and a GRE score (cutoffs vary by program) are often required. A Master's degree typically takes two years. However, some programs can be accelerated, while others (such as those leading to a teaching certificate) can take up to three years. Many people chose the M.Ed route because they want to earn their teacher certification as well. If an individual has already earned a Bachelor's Degree in a field unrelated to Education, they may choose to take the M.Ed route so that hey can earn their Education degree at the same time as fulfilling the teacher education requirements. Each state has different requirements for becoming a certified teacher. Find out your specific requirements by clicking on your state on the map below. Earning a Master's Degree in Education online is ideal for students who are already employed full time or have families to care for. These programs have become a very popular and reputable way to earn a degree. Many schools offer accredited online degree programs. If you choose the online route, make sure your program is accredited. By earning a degree online you have a wider range of specialty options to choose from, since you will not be limited to your vicinity. Since online classes do not require you to commute to campus, you will able to choose a degree option based on program details rather than geographic location. Online degrees allow you to fit classes into your busy schedule. In other words, you can work whenever and wherever you want. This allows adult students to keep up with work, family, and other obligations. This option makes schooling more accessible to different types of learners as some students report that online courses are easier to concentrate in because they are not distracted by other students and classroom activity. Another thing to consider is that you will not be required to commute to school in order to attend classes. This eliminates gas costs as well as other fees associated with parking on a college or university campus. This type of self-paced learning is very effective for independent learners. With online classes, you are in charge of how much to study and when to study. Many professors will post work and assignments in an online message forum or portal with a correlating due date. When and where the assignment is completed is entirely up to you. Class participation is also quite easier in an online setting. Most of the class "discussions" take place through online message forums. Students will be asked to respond to a series of questions and provide feedback for peers. This way, students are able to revise and control their thoughts as much as they want prior to posting. Professors can easily be reached online when questions arise. Online degrees often allow for faster completion as many programs offer accelerated courses. Although these programs may take a shorter amount of time to complete, they may also be more rigorous - as the work load is compacted to fit the tight schedule. Click on the links below to expand information on other related master's degrees in education and see details on degree requirements and courses needed. A Master’s degree in Child Development is an excellent degree for someone who wants to work as a child advocate or in the social work area. A Master’s degree can be obtained online or in an actual classroom in as little as 1 to 3 years. This degree can lead to many opportunities in working with children. Considering a a Master's Degree in Child Development? Read about what it takes to earn a Early Childhood Education Master's Degree. A Master’s degree in Early Childhood Education can lead to higher paying positions than just a Master’s degree. Many colleges and universities offer classes fully online or in person to fit into your busy schedule. Though a Bachelor’s degree in a related field is often required, many programs will work with applicants to meet all necessary requirements. Get more information on earning a Master's Degree in Elementary Education. A Master’s Degree in Elementary Education will likely lead to a pay increase for elementary level teachers. This will also allow the teacher further opportunities as far as career advancement. Many colleges and universities offer fully accredited Elementary Education degrees online and on campus. These degrees will require some form of research and possibly observation or proof of teaching hours. A Master’s Degree in Library Science is the next step in furthering or starting your career in the Library Science field. This level of degree will be required for most education based Library Science jobs. Many colleges and universities offer Master’s level classes online and on campus. Some of these classes may include "User Services and Tools" and "Database Design". Read about what it takes to earn a Library Science Master's Degree. A Master’s degree in Adult Education can lead to jobs in many places among highly varied individuals. A Master’s degree will take between 1 and 3 years to complete and is typically available online or in person. This type of degree can open many doors to entry level Adult Education based forms of employment such as teaching basic education classes in a hospital or to adults trying to enhance their own education. Get more information on earning a Master's Degree in Master's in Adult Education. Interested in earning a Master's Degree in Master's in Education Administration? Choosing to gain a Master’s Degree in Educational Leadership and Educational Administration can be a life changing decision. Master’s Degrees are often available online or on a typical college campus. Earning a Master’s will take on average 2 to 3 years if a full course load is taken. Earning a degree at this level will increase job opportunities and potential earning capacities. A Master’s degree can not only open more doors for employment, but can increase the starting salary for those new jobs. An educational counselor must have at minimum, a Master’s degree. This type of degree can be taken online or in person from an accredited college or university in an average of 2 years. This can lead to opportunities to work in the school system or as a counselor in other places. Learn more about getting your Master's in School Counseling Master's Degree. A Master’s degree in Secondary Education can be granted online or through face to face classes. Financial aid, scholarships, and grants are available to help defer the costs of such a program. Specific subject areas that are considered high needs may also have a loan pay back program through certain school systems. See details on getting a Master's Degree in Secondary Education. A Master’s Degree in Special Education typically take two years to acquire from an accredited college or university. Many programs have the time saving option of taking classes online for those who are working or trying to raise a family. A Master’s Degree will typically lead to more available jobs with a higher pay scale. Read about what it takes to earn a Special Education Master's Degree. This specialty is for teachers who wish to differentiate their teaching styles to meet students at every level on a variety of topics. Diverse learners can be those who are not native speakers and learners or those who are culturally different in speech and learning styles. A Master's of Education in Diverse Learning is intended for teachers who want to be considered experts in differentiation or those who are seeking ESL certification or special education certification. Those who choose to get a Master's in Education in Education Technology are the same individuals who are likely to use technology often in the classroom. An Educational Technologist, also known as a Technology Integration Specialist (TIS), is most often found showing other teachers how to use technology as a benefit in the classroom. An Educational Technology degree will prepare you not only to use basic programs such as Word, PowerPoint, and Excel, but also design, create, and implement lessons using technology based products such as iPads, Smartboards, and even cell phones. A Master's degree in Educational Psychology does not limit a person to the world of school counseling, though this is one area in which a Master's Degree holder could work. An Educational Psychology degree helps students to develop a knowledge base and expertise in the fields of both educational psychology and applied developmental psychology to help children, youth, and families. This type of degree could lead to an office job in which children are the focus as you are under a licensed psychologist or psychiatrist. Becoming an English as a Second Language (ESL or ELL) teacher is ideal for this time. This is a profession that is growing at a much faster rate than other education based professions. An ESL or ELL teacher is often responsible for helping students from different languages and cultures integrate into the school system. This may include working one on one with the student and family over time to ensure a smooth transition into a new language and setting. Visit our career page to learn more about a career as an ESL teacher. Earning a Master's degree in Curriculum and Instruction is likely to lead to a job as an academic coach. This type of position is for individuals who are not afraid to be leaders in their field. An academic coach is likely to go into classrooms in different schools within a district to teach teachers how to implement new standards, technology, or teaching methods to improve learning and behavior. Curriculum and instruction majors may also be responsible for writing standardized test questions or teaching others to do so. Earning a Master's in Education with a Reading Specialty can lead to a position as a teacher, as a Reading specialist, or as a curriculum coach in many areas. A Reading Specialty may also lead to a position as an ELL or ESL teacher for those who choose to take electives in that direction. A Reading Specialty will require classes in the areas of reading, phonetics, diversity, and methods in order to best serve struggling readers in the classroom. One institution that provides a program for Master of Education in Curriculum and Instruction is Arizona State University. Here is some information about their degree program including a program overview, required courses, admission requirements, and tuition. Program Overview: This program will help you investigate theoretical and pedagogical perspectives in literacy instruction while preparing you to teach and instruct fellow teachers or students. Required Courses: In addition to 6 hours of core classes and 3 hours of leadership classes, 21 hours in the area of specialization (elementary or multiliteracies) is also required. Admission Requirements: In addition to a complete application and letters of reference a single year of teaching experience and previous literacy courses are desired. A GRE score may also be necessary. Tuition: Tuition for online courses is about $10,000 per academic year for full time students. Although most states do not require their certified teachers to possess a Master's Degree in Education or a Master's Degree in Teaching, many teachers still choose to pursue an advanced degree. A Master's Degree is a fine way for educators to potentially earn more money and a great way to establish your career as an expert in the field. This higher level degree can positively impact your teaching career in a great way. Not only will teachers with a Master's Degree look more appealing to their employers, they might even receive greater benefits in the form of career advancements. Many Master's Degrees are quite costly, and a Master's in Education is no different. It is a great idea for graduate students to be aware of the different scholarships and grants available to them. The following are some of the many scholarships that may interest you if you are thinking of earning a Master's in Education. The James Madison Memorial Fellowship Foundation offers $24,000 to individuals who are in the process of becoming educators who teach American Constitution at the secondary school level. The Foundation plans to offer one fellowship to a student from each state, per year. Applicants will only go against other applicants from the same state of their legal residence. Visit our Scholarships and Grants page to learn more about funding opportunities that are available to you. Earning a Master's Degree in Education can lead to a variety of careers in education. While some may choose to go into other fields, education will offer the most opportunities for an education Master's degree. A Reading Specialist typically works with one child or small groups of students to improve reading comprehension and ability. Some reading specialists will also work with teachers to help improve the teaching strategies used to teach reading and literacy skills. The reading specialist field is growing at a higher than average rate in all areas. The average pay scale for a reading specialist is between $39,000 - $60,000 yearly. An academic coach can be found in the private or public sectors and salary will vary widely depending on which area is served. Some academic coaches will work in schools to help teachers learn new techniques and programs that are being implemented to meet current standards. Academic coaches can also be private tutors earning between $13 - $16 hourly. Some academic coaches work with parents to help students get into prestigious preschools. The outlook for academic coaches is above average as the need to meet state standards is increasing. An average salary for an academic coach in the school system will vary by area and can range from $40,000 to $120,000 yearly. A Master's in Education can lead to a teaching position if paired up with teaching certification/teaching credential. In fact many people who choose to earn a Master's Degree in Education are already teaching and are choosing to add a specialization or increase their earning potential. Teaching as a profession has an average job growth rate with an average salary between $40,000 - $60,000 yearly. If you are interested in becoming a certified teacher, read our article on Is Teaching Right For Me? A school counselor is typically found in a school building, but may also work in a psychology office under a licensed counselor or psychologist. A school counselor will work directly with students and families to solve school related problems or family issues that affect academic success. School counselors average between $40,000 - $70,000 yearly. Visit our career page on School Counselors to learn more about this career. 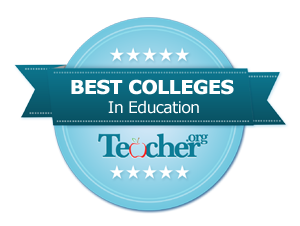 We are happy to release our Teacher.org's Best Colleges for Master's in Education rankings. This list was compiled by scoring several areas including, relative size of the program, graduation rates, default rates, tuition affordability, and online education options availability. More information about each college listed is available by clicking on the web address provided. Over 352 colleges were analyzed and the top 20 were included in our Best Colleges Ranking. For more information on education degree rankings, see our methodology page: https://www.teacher.org/college-ranking-methodology/. Offering several avenues of graduate level study, California State University-Fullerton's College of Education strives to address every teacher's career path and professional development opportunities, on a timeline that accommodates teachers' current career commitments. Candidates graduate from Fullerton's Masters programs prepared to serve their school communities in deeper capacity both in the classroom and beyond - in avenues such as leadership, literacy, numeracy, instructional technology and design. Learn more by visiting the college website at ed.fullerton.edu. With programs designed with the needs of veteran teachers in mind, Montclair State University's Graduate School of Education offers a number of Master's programs to meet the needs of today's teachers. Teachers who meet Montclair's rigorous admissions criteria are able to take advantage of several streams of studies designed to provide dynamic learning in areas of interest. Among some of the degree options are specfic content area, elementary education, or early childhood education. Dual certifications are also achievable though Montclair's dedicated faculty and scheduling. Learn more by visiting the college website at montclair.edu. Designed to promote advanced thinking in professional practice, San Diego State University's College of Education and the School of Graduate Studies is renowned amongst educators who want to enhance their practice in the classroom, at the school level, and beyond. Through a mix of scholarly reading, research, study, and collaboration, veteran teachers improve their professional horizons and opportunities in a manner that is reflective of their professional responsibilities in the classroom. Learn more by visiting the college website at go.sdsu.edu. Created specifically to deepen educator practice while ensuring that God remains first in the minds of students, Azusa Pacific University's Multiple Subject Teaching Credential and Master of Arts in Education prepares both current educators and those working beyond the classroom for the innovative thinking and rigorous research that is required at the graduate studies level. Streaming students into intern and non-intern academic pathways means that Azusa's faculty is able to help each group improve their practice on an individual basis. Learn more by visiting the college website at apu.edu. Fully accredited through the National Council for Accreditation in Teacher Education (NCATE), the Ohio State University's Teacher Education faculty is committed to assisting teachers in developing the competence and skill sets that they need to become decision-makers and leaders in the classroom and at school and district levels. With a number of licensure areas, OSU's faculty work closely with every teacher graduate student to ensure candidates are progressing along the path to a master's degree while maintaining a professional standard of practice while at work in the classroom. Learn more by visiting the college website at tl.ehe.osu.edu. Designed specifically for teachers who hold a bachelor's degree and who are looking for graduate study opportunities as well as initial teacher licensure, Regis University's College for Professional Studies is proud to help individuals achieve their professional goals through a mix of field placement and theory. Offered both through an online platform as well as on campus, Regis University's master's program builds on the mandate that research and practice form the cornerstones of successful professional growth for educators, who can then transform society. Learn more by visiting the college website at regis.edu. One of the many graduate-level options available through San Jose State University's Connie L. Lurie College of Education is the school's Master of Arts Degree in Education. With focus on curriculum and instruction, teachers who have already achieved a bachelor of education degree as well as licensure to teach will have ample opportunities to grow their professional knowledge and practice through the graduate curriculum. The two program options, Literacy Across the Curriculum for an Equitable Society (LACES) and Critical Research Academy (CRA) both have a strong social justice component. Learn more by visiting the college website at sjsu.edu. Purdue's College of Education is proud to be an important part of the graduate offerings though Purdue University. Veteran teachers who already hold a bachelor degree as well as teacher licensure through the state can choose graduate studies with an area of specialization that may include teacher education, mythology, curricular studies, education leadership, technology - or a combination of concentrations - in order to help teachers deepen their professional practice in the 21st century classroom learning environment. Learn more by visiting the college website at education.purdue.edu. University of Massachusetts-Amherst's College of Education offers a Master's of Education degree in a number of concentrations to meet the needs of practitioners. With a renowned commitment to scholarship and research, veteran teachers pursue graduate studies through UMass-Amherst's prestigious offerings. With concentrations like Assessment and Policy Studies in Education, Higher Education, and dual degree options to choose from, the department strives to meet student's needs for professional growth through theory, research and practice. Learn more by visiting the college website at umass.edu. The University of Virginia's Curry School of Education is proud to offer experienced teachers a host of graduate and professional (non-degree) offerings to help individuals deepen their practice and expand their learning. Graduate candidates who already have a bachelor's degree and Virginia teaching licensure can pursue a Master of Education degree and then concentrate in an area that suits their career goals, like Speech Communication Disorders, Educational Psychology, Higher Education, Administration & Supervision, or a number of other paths. Learn more by visiting the college website at curry.virginia.edu. Located in the heart of San Francisco, the San Francisco State University's Department of Education offers seasoned educators an opportunity to pursue their masters of education degree by deepening their research skills and knowledge base toward a particular concentration of education and pedagogy such as Adult Education, Educational Administration, Equity and Social Justice in Education, or other paths. Veteran teachers who wish to apply for admission to a graduate program should review admission requirements prior to the department's spring and fall admission windows. Learn more by visiting the college website at gcoe.sfsu.edu. Located in the heart of Cambridge, Massachusetts, Lesley University has a robust and well-renowned selection of graduate studies for experienced teacher candidates, which are offered both on and off-campus for ease of student access. In addition to offering state licensure for teachers, Lesley's Department of Education offers graduate studies and concentrations by classroom level and also by contact area. Focusing on a combination of research, study and practice, graduate students benefit from Lesley University's degree formats; offerings are also hosted throughout Massachusetts, New Hampshire, or Maine under the university's 'low residency' format, to assist busy professionals. Learn more by visiting the college website at lesley.edu. Located in Long Island, New York, Adelphi University is home to the Ruth S. Ammon School of Education, which has over 15 well-renowned graduate programs for educators. The university provides current and meaningful contributions to educators' portfolios every year, with a focus on experiential learning and strong emphasis on inclusion. Faculty is committed to improving teacher practice throughout a variety of concentrations. Adelphi degrees equip veteran teachers with the research and scholarly skills they need to build their practice in the classroom while enriching their employment horizons. Learn more by visiting the college website at education.adelphi.edu. An epicenter of academic learning, Stanford University's STEP program for graduate studies admits a limited number of teachers every year to partake in an intensive 12-month course designed to deepen their classroom practice. Students who are interested in admittance to Stanford's STEP program are committed learners and adept at time-management. Successful candidates are both passionate about and compassionate toward young people, which in turn provides candidates with high levels of personal and professional satisfaction. Learn more by visiting the college website at ed.stanford.edu. The University of North Carolina at Chapel Hill offers a variety of Masters in Education (M.Ed.) degree programs that are tailored for teachers who are dedicated to improving the scope of their practice. Degree offerings are available for all classroom grade levels, and include paths such as Masters of Arts in Education; International Education; Innovation, Technology, and Entrepreneurship; and many more options. UNC-Chapel Hill faculty combines research, theory and practice in order to help teachers achieve their academic goals, and then return to their professional environment with a deeper understanding of student needs and subject matter in the 21st century classroom. Learn more by visiting the college website at soe.unc.edu. California State University-Long Beach's Department of Education is a well-respected environment in which experienced teachers can pursue their master's studies to ascend the career ladder and deepen their practice. With several study concentrations streamed into Elementary Education or Secondary Education, teachers are able to choose from a variety of offerings in order to meet their personal and professional needs, and the needs of their students and schools. Each stream can also accommodate a master's thesis option for students interested in research. Learn more by visiting the college website at ced.csulb.edu. Veteran teachers return to University of La Verne's graduate school of education in order to develop their practice in elementary education or secondary education - or in concentrations such as educational literacy, school psychology, or educational leadership. With a thesis option to complement the graduate degree, teacher candidates are able to apply theoretical and research knowledge to the curriculum and assessment practices in their school and classroom environment. University of La Verne faculty is proud to help teachers who are called to serve their community in instructional leadership practices. Learn more by visiting the college website at laverne.edu. Towson University has a 150-year history of educating classroom teachers, education specialists, and school leaders to better serve their school communities. Led by world-class educational faculty, students at Towson University are part of a growing educational movement to reach each student to develop their full potential as a learner. With an evaluation of past educational movements, students are drawn toward greater understanding of today's systemic forces in education and may choose from a number of concentrations like elementary education to better understand the diverse nature of learners and our the impact on learning Learn more by visiting the college website at towson.edu. Located in the heart of Ann Arbor, University of Michigan has a variety of graduate studies options for those veteran teachers who already possess a bachelor's degree and state licensure. Candidates pursuing their Master of Arts in Educational Studies study on a 10-month full-time schedule. Students are given the option of pursuing four strands of disciplinary expertise and switching between them at will in order to craft a unique learning experience. Graduates emerge with an enhanced skillset for implementing school improvement and creating strong learning communities. Learn more by visiting the college website at soe.umich.edu. Located in Richmond, Virginia Commonwealth University's Faculty of Education is home to a renowned host of educational leaders who instruct and guide veteran teachers to deepen and improve their practice. In the context of the classroom and the wider school environment, candidates make useful connections between theory and practice, and faculty takes pride in helping students to communicate their enhanced understanding of education to students, classrooms, and schools. Virginia Commonwealth offers a variety of strands on- and off-campus to support teachers' interests such as adult learning, counselor education, curriculum and instruction, reading, and more. Learn more by visiting the college website at soe.vcu.edu.